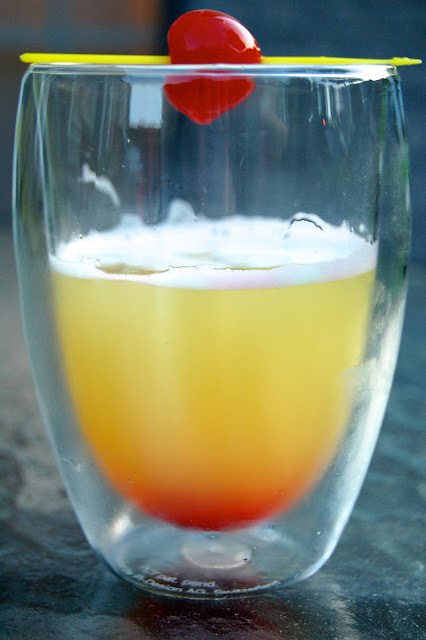 To kick-off Cocktail Month, we are going to share a delicious combination of pineapple and peach, we like to call the Tuscan Sunset, so aptly named from a special time in my life. Back in college, I had the chance to study abroad in Florence, Italy. It was there that I officially grew up and became an adult. I developed a sense of independence, curiosity and culture. During my first week, fellow students and I discovered the best little café and our soon to be favorite bartender, Claudette. After dropping in several days in a row, she made us her special concoction of pineapple juice and peach vodka (vodka alla pesca) and we would drink while the sun set over the Duomo. I was hooked. I started ordering this everywhere in Italy. I developed a signature drink at 19 years old (and yes, I was drinking under age, but hey, I was in Europe). I remember writing my parents from Florence and telling them about this drink. I now look back and think that this probably concerned them that I was so excited about a drink and not the classes I was taking. But that was not true, I LOVED the classes. I had to take a few required history courses, but the majority of my time was spent in the studio studying oil painting. It was a blast, and I had the chance to work with some amazing professors (and create some of my best artwork). I took it all in. Everything about Italy was amazing, beautiful and interesting. I traveled to Rome, Venice, Capri, Sorrento, Cinque Terre, but spent most of my time in a little apartment in Florence, right across from the Accademia Gallery (home of Michelangelo's David). My favorite spot was Capri….by far the most gorgeous place in Italy. You must go during the early summer so you can see the grottos (natural caves) and travel to the top of the island for the best gelato and view of the Mediterranean. I have found a few types of peach vodkas over the years; Stoli, Pinaccle, Absolut. I think that Absolut Apeach is the best flavor though. You could also take a stab at making your own peach infused vodka. If you have a juicer, you could also make fresh pineapple juice, but I usually don’t like to pull out my juicer to make a cocktail. I get the fresh pineapple juice from Trader Joe’s (not made from concentrate and no sugar added). Years later, I still love to make this drink when it starts warming up. It reminds me of the wonderful memories that I made while in Europe AND the beautiful Tuscan sunsets. Fill a cocktail glass with as much as ice as desired and transfer the ice to the shaker. Add in the pineapple juice, vodka and cherry juice and shake vigorously. Pour the drink with ice into the glass and add in the cherries on a toothpick or drop in the bottom of the glass. Enjoy!